A per­cep­tive arti­cle on the growth and evo­lu­tion of the PLAAF. In the ear­ly years, PLAAF was con­cep­tu­alised as ancil­lary and long range artillery of the army; PLAAF was quick to embrace RMA after the Gulf war and by the turn of the cen­tu­ry start­ed con­sol­i­dat­ing on var­i­ous aspects like infor­ma­tised and asym­met­ric war­fare tech­niques and enhance its strate­gic pow­er pro­jec­tion capa­bil­i­ty in an effort to build itself into a strate­gic air force by 2020. China’s use of air­pow­er in the 21st cen­tu­ry is also guid­ed by the phi­los­o­phy of coer­cion aimed at com­pelling to change the behav­iour of the tar­get State. 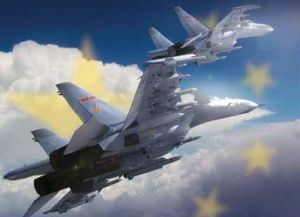 The total num­ber of fight­er and bomber air­craft with PLAAF in 2000 con­sist­ed of 1900 J-6; 720 J-7; 222 J-8; 55 Su 27/J-11; 440 Q-5 (mod­i­fied MiG 19); 305 H-5/IL-28; 142 H-6/Tu-16 and just about a dozen JH-71 .Its front line bomber fleet con­sists of no more than a hun­dred H-6 air­craft with a weapon car­ry­ing pay­load capac­i­ty lim­it­ed to 20,000 pounds; the peri­od did see a change in PLAAF’s pro­file from an ear­li­er force which con­sist­ed of basic fight­ers with lim­it­ed radius of action, low end avion­ics and lim­it­ed fire pow­er capa­bil­i­ties to a force equipped with AWACS, air to air refu­elling and mul­ti-role tac­ti­cal air­craft with high end avion­ics, fire­pow­er and extend­ed radius of action to reach at least the first island chain, Sprat­ly and Para­cel.